Research indicates that eCommerce businesses have only a few minutes to capture attention in the digital marketplace. You have already done half the work when a potential customer visits your site. However, the larger challenge is to translate these visitors into actual leads for your product. This connection is only possible through an effective, well-designed landing page. Such a page should give customers the information they need or capture their product requirements. These landing page WordPress themes aim to achieve this objective. They will not only enable you to target your audience but convert mere visitors into lucrative leads for your business. All these landing page WordPress themes themes require a self-hosted WordPress site. 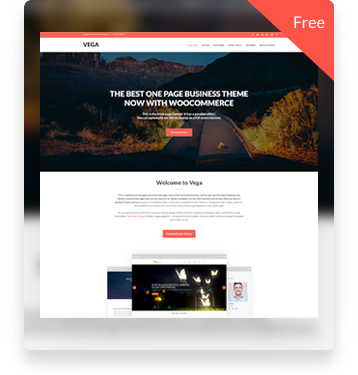 Vega Pro is a mobile friendly and multipurpose theme. It is easy to set up and to customize. Initially, it projects a minimalistic vibe. However, it is chock full of features that aim to create a great one-page business site. Vega Pro comes packaged with a large pool of features, perfect for landing page designs. There is ample choice in layout composition packed with parallax image options. You also have access to different home page and blog feed display options and all content post types. The site also allows you select the position of your front page navigational bar and features plentiful variety in Google fonts and colors schemes. This theme is also translation ready. You cannot go wrong with this choice for your landing page or single page website. 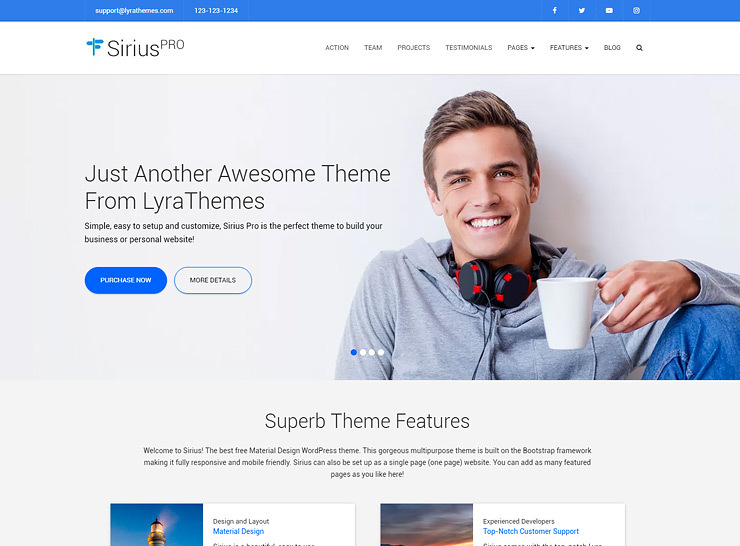 Sirius Pro is another clean and multi concept theme that you can use as a landing page WordPress theme. Though the site is designed to cater to a large variety of displays, including as a corporate website, or a small business website Sirius Pro works well for landing page sites as well. Sirius offers a comprehensive feature set. The front page offers single page scrolling features so you can easily set up a one-page landing page. Moreover, you can showcase your array of products using the builtin portfolio feature. The theme offers versatility in background imagery, color schemes, and font styles. They are multiple home page and blog feed display options, with the homepage having parallax background options. In addition, you can use widgets for team profiles, testimonials and information cards. The control panel has tons of shortcodes to customize site elements as well. 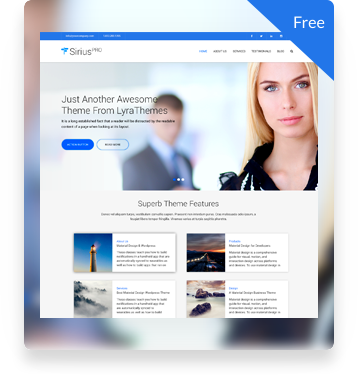 Sirius Pro is an easy-to-use, fast and light-weight theme option to choose from. It comes with complete support documentation and demo data to create your ideal landing page website quickly! Divi is a one stop shop for designing WordPress pages and can easily serve as a landing page theme. 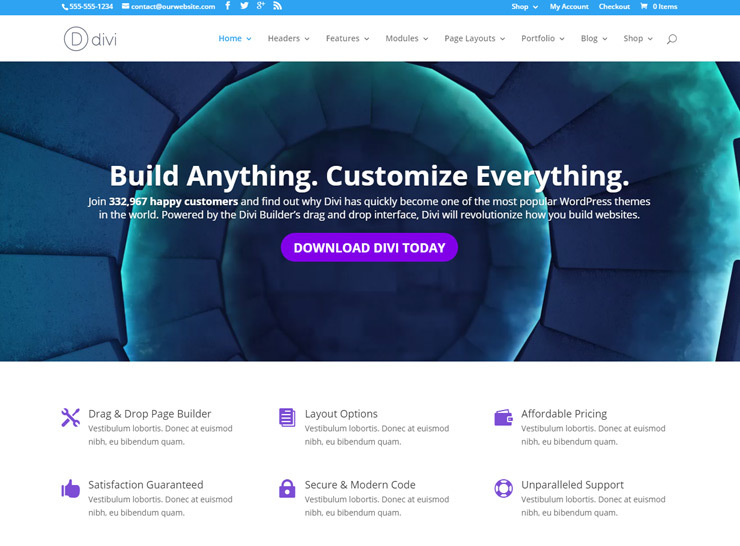 Its main forte is the Divi builder, a fast and flexible front end editor. You can edit just about anything like colors, text, font styles, and text spacing. You can even apply custom CSS. Similarly, the text editor is very user-friendly as you can make text amendments directly from the page interface. You can effortlessly switch between the front end and the back end to review changes that you continue to make. Divi also offers a grid-based layout for your landing page design. You can also use the main theme with a child theme and limit your customizations to the child theme. This will allow you to benefit from any updates that are available on the main theme. In addition, there are 40+ versatile content types to spruce up your site. 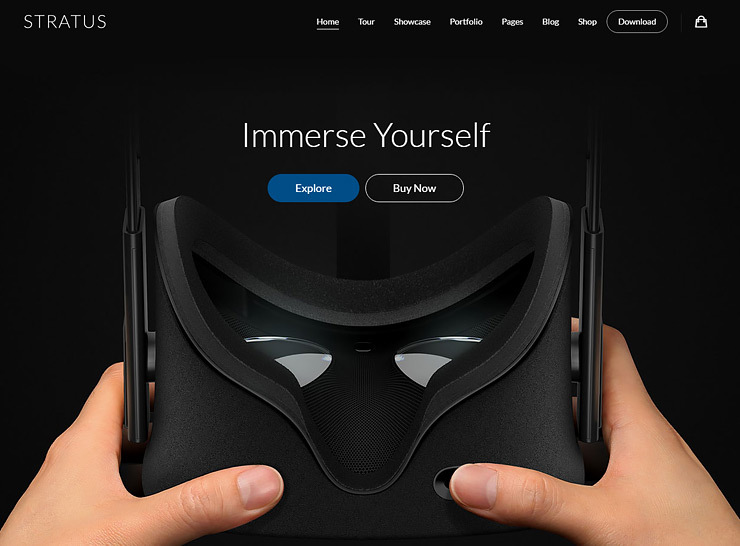 You can check out a sample of the landing page created by Divi here. If you design your own layout, you can save it in the embedded library. Moreover, there is a wide array of ready to install templates available as well. In addition, you can also select from templates from the Divi community. Divi is a platform more than a theme, giving you plenty of options and flexibility to design your own landing page website. 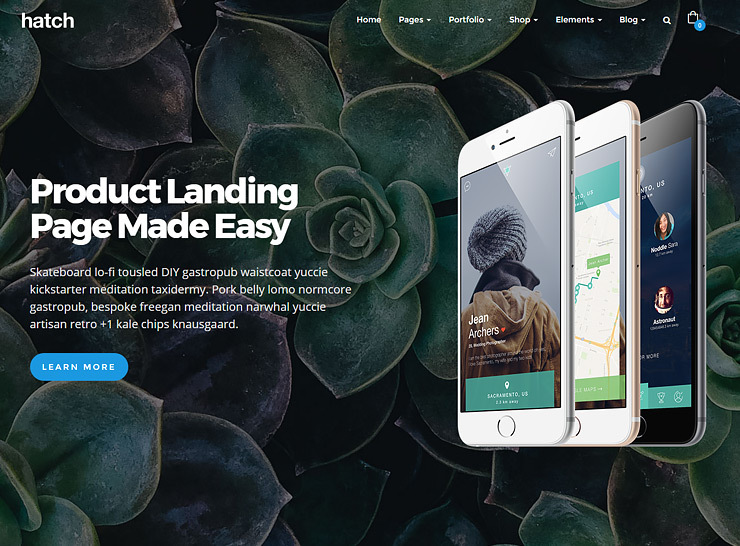 Hatch is a smooth looking landing page WordPress theme. In addition to its own user-friendly interface built on the Bootstrap Framework, it supports several popular plugins. These include Visual Composer, Slider Revolution, and Essential Grid. Hatch is also translation ready and compatible with the WPML plugin. It is also SEO friendly, with a clean and light code. Your one-page site can have almost any type of layout. A unique feature of this theme is the Minimal Form which allows you to capture basic data points about your customer. It features many eye-catching options. You can have a video or any other type of custom background as well. The layout is responsive and features parallax background. It also offers CSS3 animations, multiple header types and unlimited options for Google fonts. Both dark and light color scheme are available to choose from. With one click demo install and extensive documentation, this theme is worth a try. 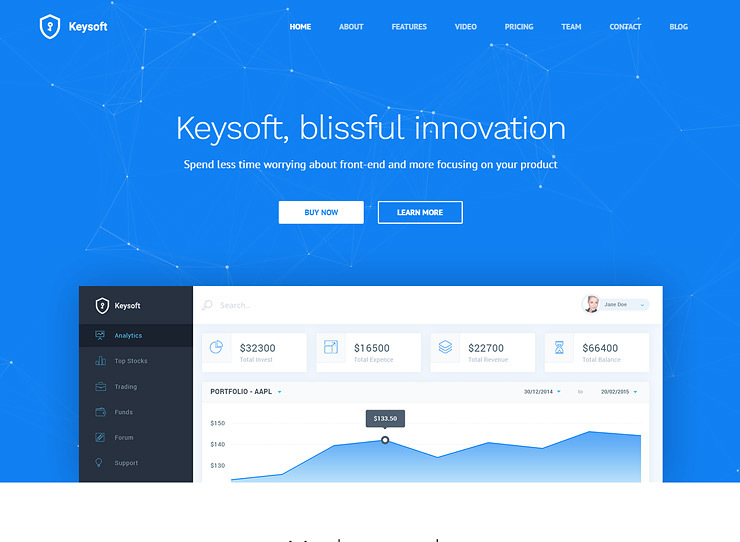 KeySoft is a landing page WordPress theme, primary for the computer industry. It is 100% customizable through its powerful admin panel giving flexibility in the hands of the user. Plugin support includes Visual Composer and you can modify up to nine Visual Composer elements. 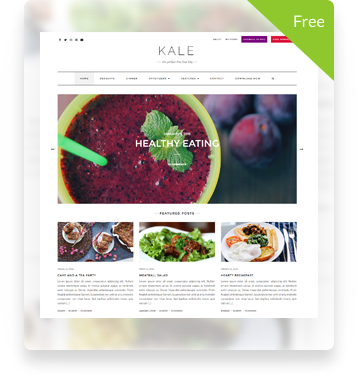 There are several layout styles (dashboard, mobile, subscribe) and header styles (particles, video background, and image overlay) available as well. You can also enable a contact form from the admin panel, that is further customizable using the extensive icons available. The theme features unlimited color schemes and Google Fonts. It also has the modal option to import YouTube videos and image files. This theme focuses on user experience, with its smooth scrolling and responsive layout. If you are looking for an easy to use theme that offers the perfect blend of features for your landing site, choose KeySoft. 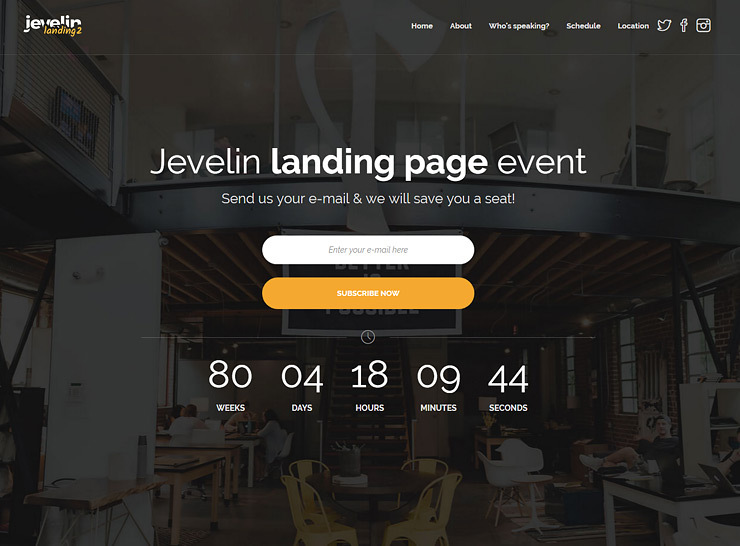 Jevelin is a modern age WordPress theme for landing pages. Its main source of strength is a powerful admin interface with flexibility in layout composition. Jevelin is easily customizable with a drag-and-drop page builder. You can easily change accent colors and the header layout. You can even have separate standard, sticky, and mobile versions for the header logo. There are several portfolio combinations, each featuring its own set of image overlays and description fields. Additionally, there are several blog layouts available. Jevelin supports multiple custom post formats and is widget ready. Widget support includes contacts, social icons, and portfolio images. In addition, you can modify the page background to host a video or any kind of animation you prefer. The footer area, which allows parallax background, is customizable to include a four column grid layout. Additionally, you can tag multiple locations on Google Maps. Translation ready with RTL support, this is a great professional looking theme to choose for your landing page. 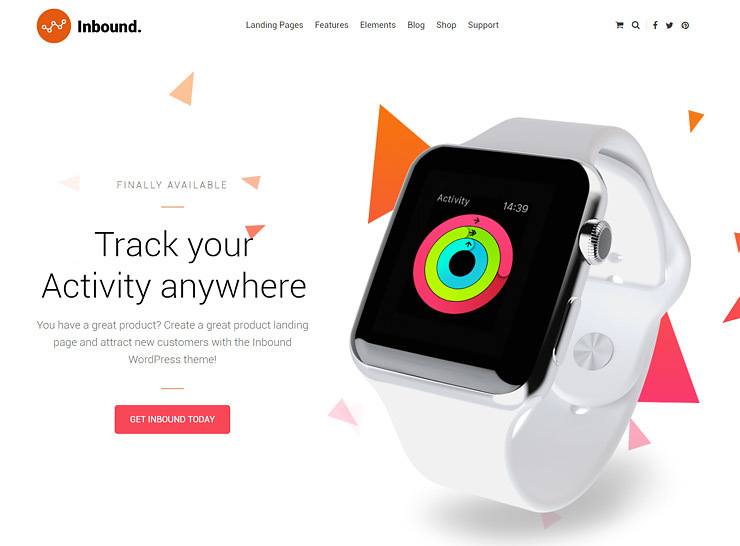 Inbound is a fast and flexible landing page theme for WordPress. Every site element aims to convert site visitors to business leads. The admin panel has tons of customization options available. It provides options through building blocks which you can drag and drop onto your landing site. You can modify or rearrange these blocks and use them to embed any kind of content. For example, you can use Modal Windows to display any kind of content on your site and connect them with call to action buttons. Many stunning and distinctive premade pages are available and you can also try any of the demo templates. Page options include the capacity to add banners wherever you want. Blog layout options include both minimal and masonry choices. Inbound adapts beautifully to any screen size and it is fully responsive and retina ready. It features access to both Google web fonts and Font Awesome icons. It works great with popular SEO plugins such as Yoast SEO. Inbound is an easy choice for the novice user who can play with the theme options to create their own landing page website. 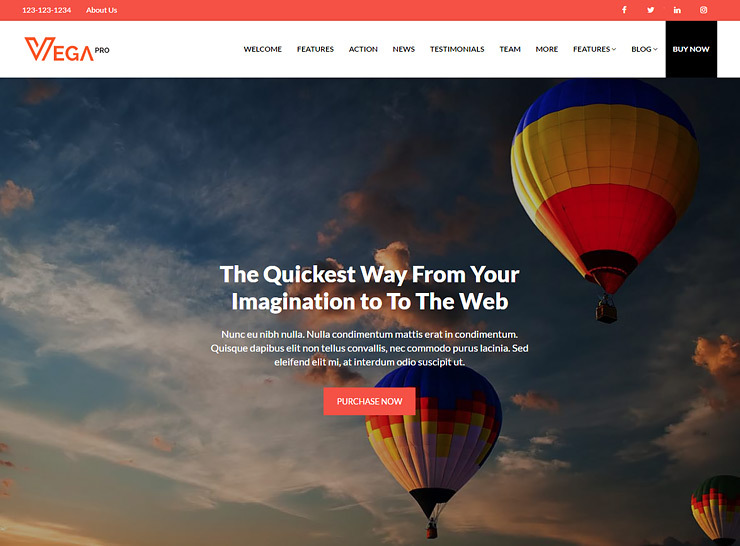 This is a concept oriented WordPress theme that you can easily modify to serve as a landing page for your venture. Backed with a robust admin panel, its most distinctive feature is the native modal boxes. Modal boxes can display any content like video, audio or text. You can further accentuate the content with over 50 animation styles. In addition, you can use time-based triggers to decide when the content becomes visible to the user. The size and position of the boxes are also in your hands. Additionally, the theme includes a builtin library for forms that will help capture useful data points for your business. The form manager enables you to send auto responses. It works effortlessly with newsletter service providers like MailChimp and Campaign Monitor. Aside from this, the theme offers several cutting edge home page styles. You can host a video in the background. Alternatively, you can add a featured slider with animation and click-through option. With these features, you will definitely be able to create an effective landing page to market your product and capture viewers. There are unlimited colors and fonts and custom widgets to add further punch to your site. 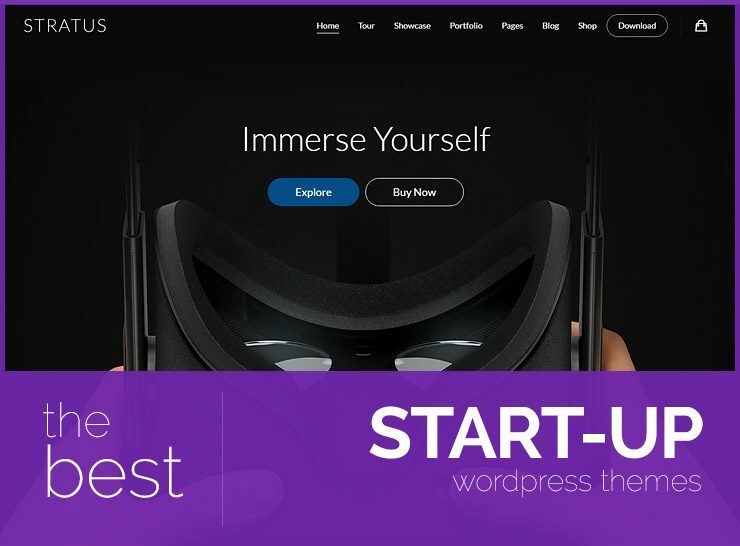 Stratus is a premium landing page WordPress theme, designed specifically IT based startups and companies. It offers a number of smart features like a smart and responsive design as well as an easy to use frontend editor. Plugin support includes WooCommerce, WPML, Master Slider Pro and Glyphicons Pro. Master Slider Pro and Glyphicons Pro give you access to 1,000+ business icons to stylize your landing page. In addition, WooCommerce makes it possible to monetize your site and WPML makes it translation ready. Even without the plugin support, the admin panel incorporates tons of Bootstrap shortcodes to customize your site. You can format your layout with unlimited sidebar and widget areas. You can also choose from either the boxed or full-width layout for your page. Additionally, you can make the header sticky for easier site navigation. This theme offers comprehensive support documentation. In addition, there are video help tutorials to assist you in the setup process as well. 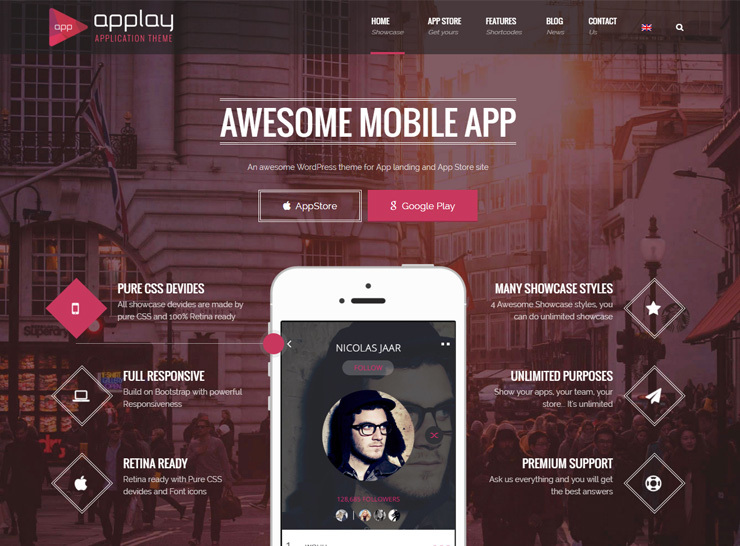 Applay is a multipurpose WordPress theme particularly meant for showcasing new apps. It is already widely in use as a landing page for business and shopping apps available on the Apple Store or Google Play store. Applay comes with a drag and drop page builder, featuring unlimited colors and layouts. This theme also offers you the option to fetch app info from Apple iTunes and Google Play stores. It also offers email notifications for when new information pops up on your page, such as new testimonials or feedback on your app pulled from iTunes or Google Play. It further supports screenshot images from external URLs. 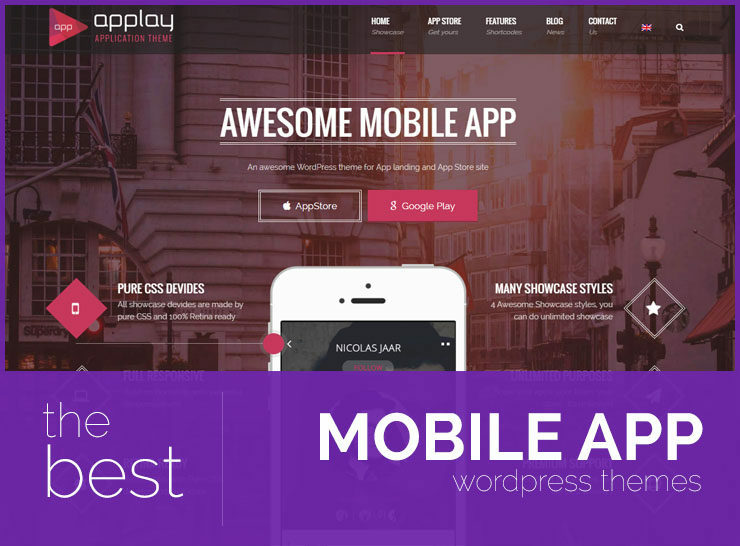 Applay is also compatible with WooCommerce, WPML and Visual Composer. In addition, it supports quick Ajax Query to help you organize data elements based on your preference. It also provides access to the Mobile Mockup plugin. Built using Bootstrap, this theme is ultra-responsive and retina ready. It is also quick to setup with demo data and extensive support documentation.